I think by now it’s pretty evident that even for someone who spends a vast majority of my time in a kitchen, I am not immune from messing up. Last week I got this monstrous, beautiful sweet potato from Heron Bay farms at the market. Ooh I’m going to make mashed sweet potatoes! In my head I was already 10 steps ahead, patting myself on the back for my tasty dish and for being such a good roomie, making some for Heather, who’s been wanting some. I put in the fridge, determined to resolve the issue in the morning. What to do? Boom, inspiration hits! I have this tendency when my market baking goes awry or if something is not pretty, I just roll it into balls. Little popable things. Why not roll the sweet potato into balls then. While I’m at it, why not let them roll around in a little coconut flour. How about pushing it further and frying it in some coconut oil? So I did. Naturally they were tasty and probably better than the mash I was intending on making. Thank you life for once again giving me what I need and not just what I want. Universe you are so much wiser than I.
Let’s Make it Happen: Peel sweet potato. Cut into cubes. Scatter evenly onto a baking sheet. Sprinkle with cinnamon, pumpkin pie spice, sea salt, and cayenne pepper. Drizzle wit a bit of honey. Bake @ 350 until the sweet potatoes are tender (soft). Cool for a moment. Toss in a food processor with the cream cheese. Stick the ball in the fridge. 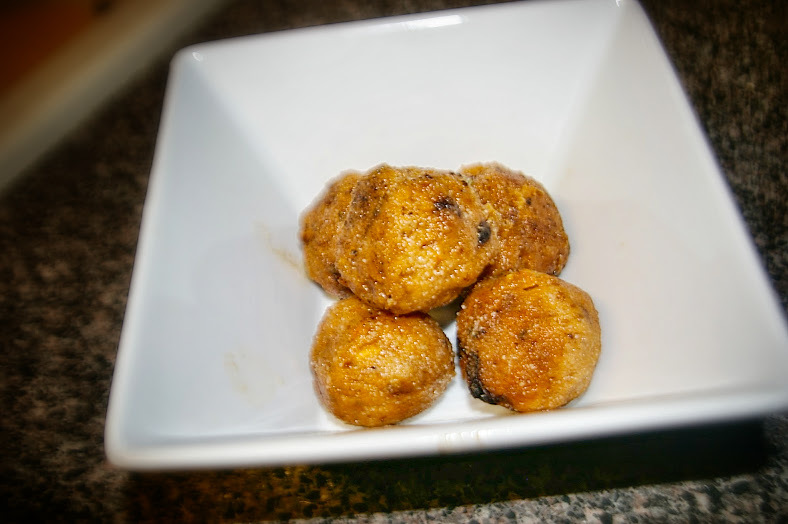 Form into bite-sized balls. Roll in coconut flour. Heat coconut oil in a skillet. Carefully place the balls into the skillets. Fry on all sides. Eat and enjoy!